Graphic of Calistoa provided by Peachtree City Planning Department. A developer is asking the city to lift its moratorium on multi-family rezoning requests to allow consideration of a luxury lakeside development next to Peachtree City’s Falcon Field airport. Dubbed Calistoa, the 37-acre site is part of the city’s dwindling industrial park and is currently zoned GI for General Industrial. The site also is listed as industrial on the current land use plan map, which underlies the zoning map. The moratorium has to be lifted before city staff can dive into the application and make a recommendation to the City Council. 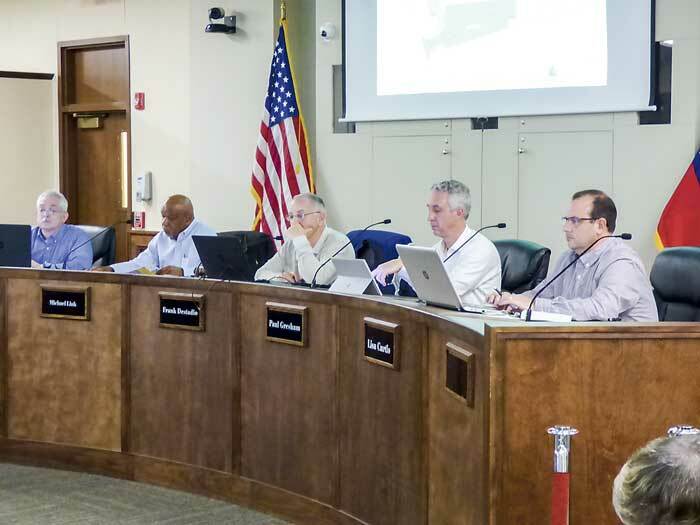 The council will decide at its meeting Thursday at 6:30 p.m. at City Hall. GVI-Peachtree City, LLC, is proposing to build a mixed-use complex consisting of office, retail, single-family and multi-family uses. 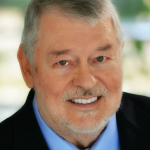 Commenting last month on the Calistoa proposal, Peachtree City Airport Authority Chairman Tom Fulton said, “We are pleased to see that the development team shares our desire to develop areas nearby the airport in a manner consistent with FAA guidelines and appreciate their willingness to work collaboratively with the airport.” — Ben Nelms also contributed to this article. 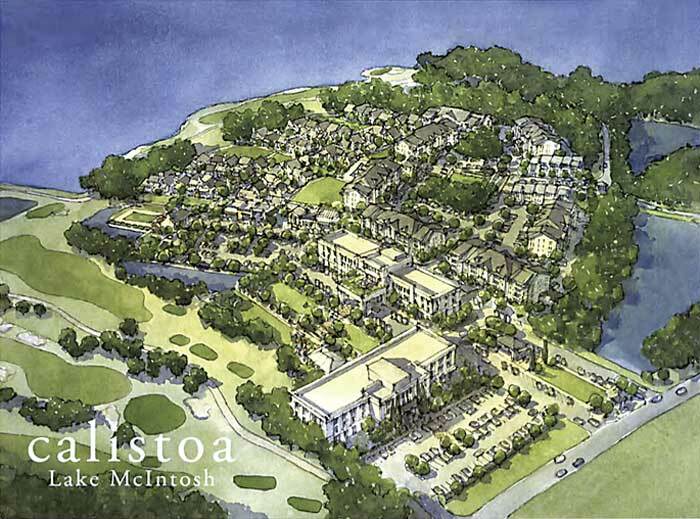 The initial presentation of the Calistoa Lake McIntosh mixed-use development before the Peachtree City Planning Commission on March 11 was pulled from the agenda, and will not be rescheduled until the City Council takes up the issue of lifting the city’s ongoing moratorium on apartments. Planning Commission Chairman Frank Destadio at the outset questioned if Calistoa would require rezoning, and was told by Planning Director Robin Cailloux that it would. She added that the item could return at the commission’s March 25 meeting if the council lifts the moratorium at its March 21 meeting. That said, Destadio indicated that he did not believe the proposal should be a workshop item until the moratorium issue was decided. Commissioners J.T. Rabun, Michael Link and Paul Gresham agreed. Clarifying his remarks, and given that the mixed-use proposal for the Aberdeen retail area, which also includes apartments, was heard as a Feb. 25 workshop item before the Planning Commission, Destadio said the commission agreed to hear that item because the current shopping center property is part of the soft roll-out for the emerging city center concept aimed at creating a downtown mixed-use area along portions of Ga. Highway 54 from City Hall past Willowbend Road to the west. The Aberdeen proposal was the first piece of that concept, Destadio added. Responding to the move that had the Calistoa agenda item pulled, developer Pace Lynch Principal Jason Pace said he had come to the meeting thinking that it was appropriate for the commission to hear the Calistoa presentation since the Aberdeen proposal had been heard by planning commissioners.